According to a reliable source, whose info has panned out true in the past, we could have a brand new HTC flagship on our hands next week. 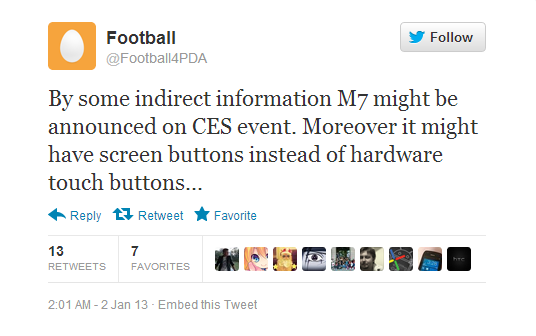 The M7 device has been reported on before and if we receive what has been rumored, we are looking at one top of the line device. So far, we have an aluminum uni-body design, 5″ 1080p HD display, Snapdragon S4 Pro quad-core processor, 13MP back-facing camera, 2,300mAh battery, and now, on-screen buttons instead of HTC’s hardware touch options that we have been plagued with over the past year. For being able to keep any images of an apparent device from the public with a announcement taking place next week, HTC could possibly get an A+ if this turns out true. What say you? Does the M7 sound like HTC’s new saving grace?